Position your ladder against the side of your home. Measure the length of your gutter. Roll out your screen gutter guard to that measurement and cut it. Wedge the guard between your gutter and fascia so that it fits snugly. Continue along the rest of your gutters. 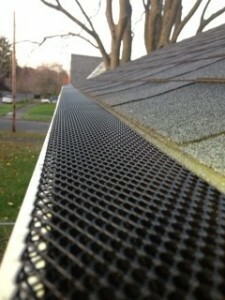 Starting at one end of your gutter, drop your gutter guard into place. Wedge one side of the guard underneath your fascia and place the other side over the outside lip of your gutter. Use your drill and screws to screw the guard into the lip of your gutter. When you get to the other end of your gutter, cut the last piece of guard to fit. Repeat steps 1-5 with the rest of your gutters. Starting at one end of your gutter, slide your gutter guard between the bottom layer of shingles and the underlayment. If you can’t maneuver the guard between the shingles and underlayment, you can slide it between the last two layers of shingles instead. Slide the other end of the guard underneath the lip on your gutter. Depending on the style, your guard will either have a lip to fit snugly or you’ll have to screw the guard down. Slide other end of your guard underneath the lip of your gutter so that it fits snugly. Some types of surface-tension guards will have rivets to secure them while others simply use tension to stay put. Measure the length of your gutter and cut your gutter guard to that measurement. Slide your gutter guard underneath between the bottom layer of shingles and the underlayment. Place the other side of the guard over the lip of your gutter and screw into place. You can also bend up the one end of your guard and screw it into your fascia instead of sliding it between your shingles.